News arrives over the weekend that the 62.33m Feadship superyacht Fortunato has relocated and is now available for inspection in Monaco until August 15th. A central agency for sale by Merle Wood and Peter Croke of Merle Wood & Associates, she was built by Feadship's Van Lent yard in 2000 and refitted in 2007. 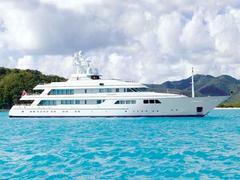 With seven large staterooms, she sleeps 14 guests and benefits from many recent interior upgrades. With an elevator to all decks and fitted with zero speed stablisers, Fortunato is Lloyds classed, MCA compliant and is currently asking $69.9 million.